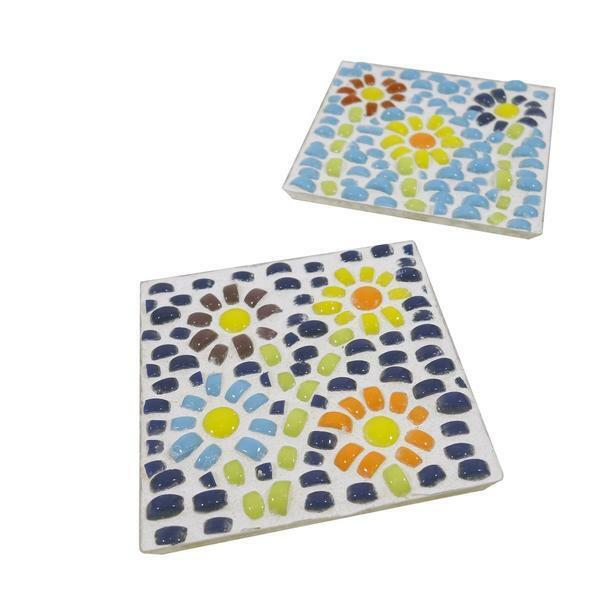 Bring a touch of the garden indoors with this sweet mosaic coaster set. PROJECT TIP Never dispose grout down any drain. Instead use a paper towel to wipe out mixing bowl, throwing excess grout in a trash receptacle. Following the pattern, use whole yellow and orange dots for the centers of the flower and wearing safety glasses, nip dots in half and arrange 9 or 10 petals (placing dots on the nipped side) around each center. Create 3 or 4 flowers per coaster. Glue down flowers and add stems using the nipped green dots. To do so, nip the green dots in half and glue from the flower to the edge of the coaster. To create the background nip blue dots in half and position in lines to fill the background. To fill in tight spaces, nip the dots into quarters. Mix 1/4 cup of white grout with enough water (1 ½ tablespoons) to achieve the consistency of peanut butter. With a gloved hand, smooth grout over tile, filling in the crevices. Remove as much excess grout as you can with your hand. When dry, buff with a smooth cloth.